The only official walk in the Crows Nest National Park that is commonly walked by the public: the Crows Nest Falls and Koonin Lookout (see map below). The entire trail is 4.8km return and should take about 45 minutes. The Valley of Diamonds hike I am writing about here is an off trail hike starting and ending on the official trail. Unfortunately I am unable to modify the map below due to copyright laws. The actual trail I took contains a well-traveled old trail and there are several trail markers in the early part of the walk. Map is owned by and used with courtesy of Queensland Government. Please visit that site for more detailed information on hiking in this region. 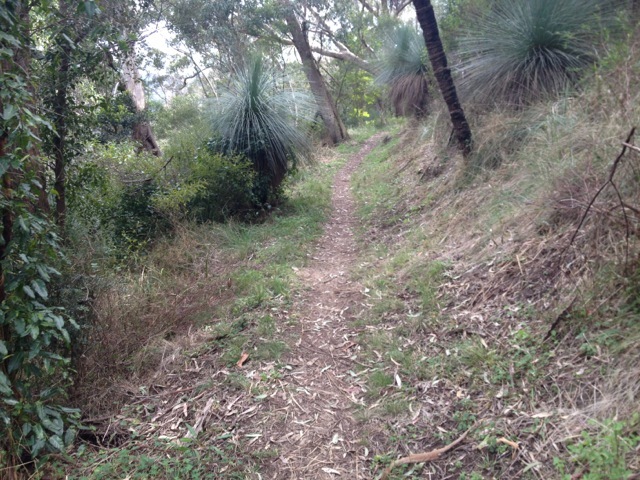 I headed off from the car park along a well-groomed path for a couple of hundred metres. I turned at a junction and headed down the steps to The Cascades. The Cascades is an interesting waterfall. There’s a large pool at the top that flows into a channel of rock that acts like a dam. The water enters the channel on the right side, flows the length of the dam and exits on the left on the other side, down a set of cascading rocks. It’s easy to see why it’s a tourist attraction. There’s also a large pool at the bottom where you can swim. I crossed a concrete causeway just above The Cascades to the far side of the creek and slipped up a hidden trail behind some trees. The trail climbed hidden around the side of the gorge and across the ridge on the far side. You can’t see any of the falls or water from this side. I climbed until I came to a dirt 4WD road and a trail marker- a short post with a luminous arrow nailed to it pointing the direction. I followed the dirt road for a few hundred meters until I came to a locked gate which I skirted and continued on. Every now and again I would come upon a track marker pointing the way. The road continued for another kilometre before turning sharply to the left. There I found another path and a track marker pointing me along it. The trail opened onto an open dry grassy plain. I continued on until I came to Perseverance Creek. This is the same Perseverance Creek as the one I walked along yesterday, just north of the lake. I walked down to the creek and disturbed a massive bird not two metres away – a Wedge Tailed Eagle. That one moment made my entire weekend. If I had been faster, I would have had my camera out and taken shots, but could just stare as it circled into the sky and flew away. This explains the crow feathers I’d found yesterday and the feathery remains I noted in a couple of other places. High on that little experience, I continued following the trail markers along the creek and south through patches of Lantana – yay! I don’t swear much, but this weed no longer just goes by the name Lantana for me. I have prefixed it with an F word. There wasn’t as much of it as yesterday and I was able to skirt it for the most part. Today I wore only shorts, so my legs suffered a little, but nothing like my arms did yesterday. 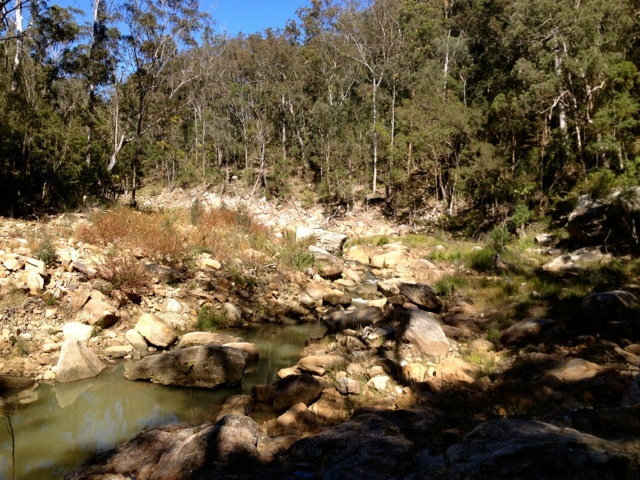 After a couple of kilometres and several areas of skirting Lantana and rock hopping, I arrived at a large pool. I followed a 4WD dirt track on the far side up a hill for several hundred meters to a bitumen road and a picnic area next to Perseverance Lake. On the far side of the lake was the ridge I had climbed along yesterday. I took off my boots and sat down for a bit of a relax before beginning the trip back. I should have probably brought some food, as this was the perfect lunch spot and if I knew how long it would take me to get back, I would have. After a short break, I retraced my steps back to where I had seen the eagle, but instead of heading back up along the 4WD track I instead headed upstream along the creek. No more track markers from here… I followed the creek, avoiding Lantana as best as I could until I arrived at a section classified as ‘rapids’. There were none as it had not rained here for some time. I rock hopped back and forth across the river until the rocks began to get somewhat larger. Rock hopping through a gorge is a slow activity, especially when the boulders are the size of cars. 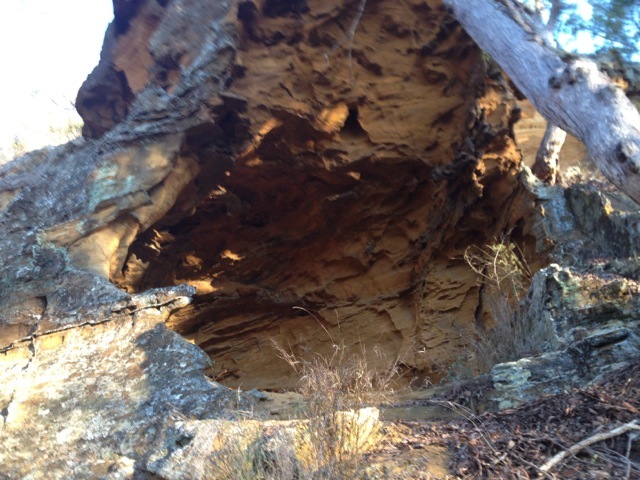 I entered the Valley of Diamonds with it’s massive solid stone cliffs and boulders littering the creek bed. Flows of waters moved through some areas of the creek. I continued along the valley at a snail’s pace, having to climb and slide down to get to different areas. I arrived at a large pool and stopped to read the description in the book. It said, ‘If you arrive at a large pool, you’ve come too far. The escape from the gorge is a gully up the side of the cliff just back from the pool.’ The gully in question is 150 metres tall. I took a drink of my water and it ran out. 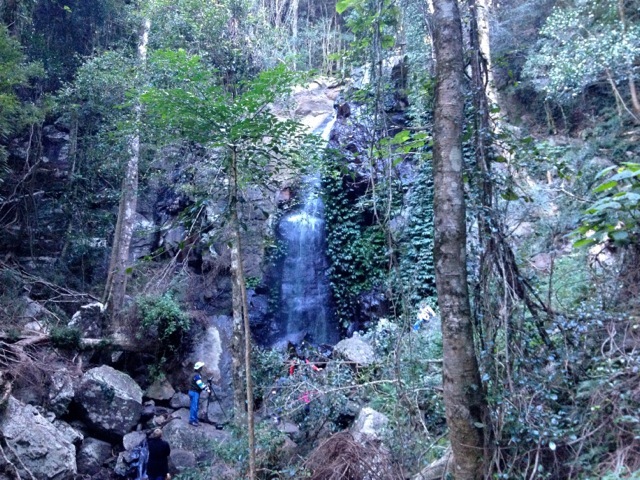 The climb was not hard, but without water and it being a warm day, I was knackered by the time I reached the top. 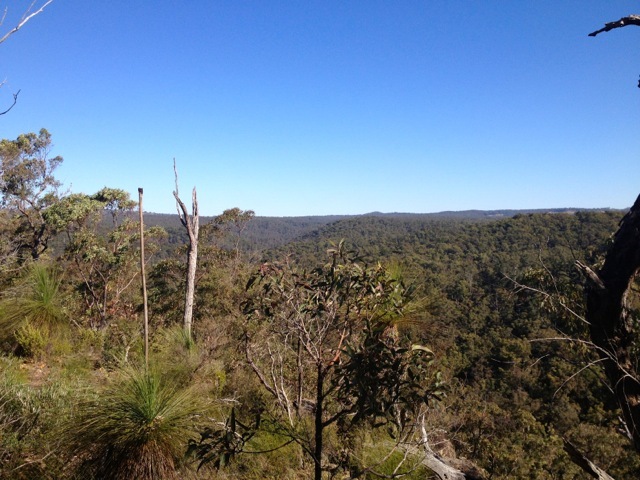 I climbed a little further to Koonin Lookout and looked down the gorge from whence I’d come. 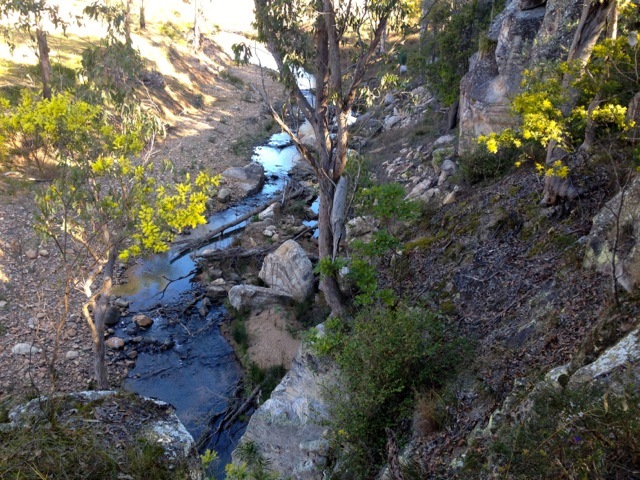 Then it was along the official track past the Crows Nest Waterfall and back to the car park where water and food waited. 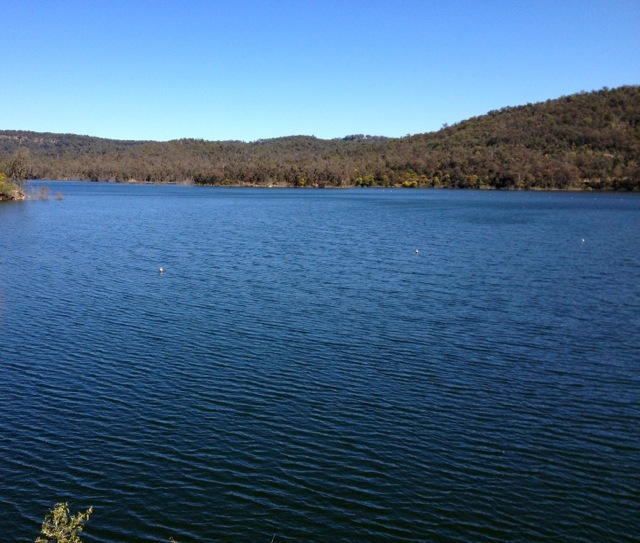 After a short break, I packed up the van and began the two-hour drive back to Brisbane. 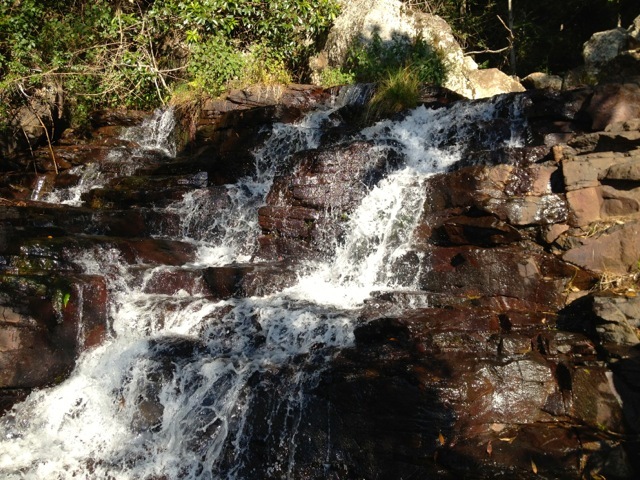 Next Weekend I’m off to Moogerah Peaks National Park where I’m taking the hiking group up Mt Greville. For my second hike of the day, I arrived at the trailhead at about 2pm. The trail begins at a locked gate and heads into the National Park on a wide dirt vehicle track. Several tracks lead across the path and I had to retrace my steps a couple of times to ensure I was on the right one. Eventually I found another locked gate on the side of the trail marking my way forward. I continued to the east, passing a junction that according to the map would lead to my eventual exit route from the circuit. I followed the dirt road for about 1500 metres until I came to another locked gate. While the vehicle track ended here, the walking trail continued on the other side. I walked on up a steep hill along a fairly obvious path to a bluff and peered down a cliff. … and followed it until it began to widen – Perseverance Creek. I headed along the Lantana brush covered left bank, trying to avoid the little thorns wherever I could. The trail headed along the top of the bank but was either cut off by a fence or Lantana, forcing me inland through more patches of the scratchy thorny weed. Oh for a machete! I would push through to the trail along the top of the bank only to be forced back inland again. By this time the backs of my hands and forearms were heavily scratched, nothing serious, just war wounds of the hiking kind. The river is beautiful as it curves around through the land. I followed it around on a thin trail avoiding the bushes and hanging on to grass so as not to fall into the water. I edged around to a tight bend in the river where a gully climbed between a pair of ridges. I headed into the gully but was confronted by wall to wall Lantana. Yay! 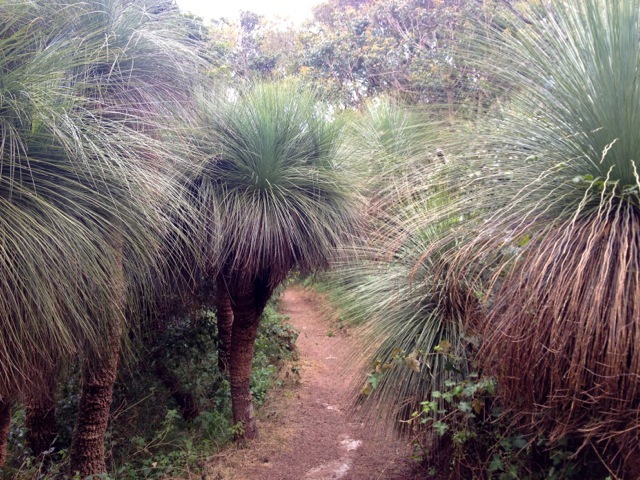 Already covered in scratches, I rolled down my sleeves and pushed through until I came to a path crossing the gully. I ignored it and continued up the gully but the Lantana became too harsh. I backtracked to the junction and followed the path to the north until it hit another wall of Lantana. I retraced my steps again and pushed to the south. While this hit a thinner wall of Lantana I decided to push through as I was running out of light. With the Queensland sun setting early in winter, I didn’t want to be caught on the side of a bank or halfway up a ridge at sunset. Past the thin wall of Lantana, I headed along the side of the bank and around towards the ridge line. 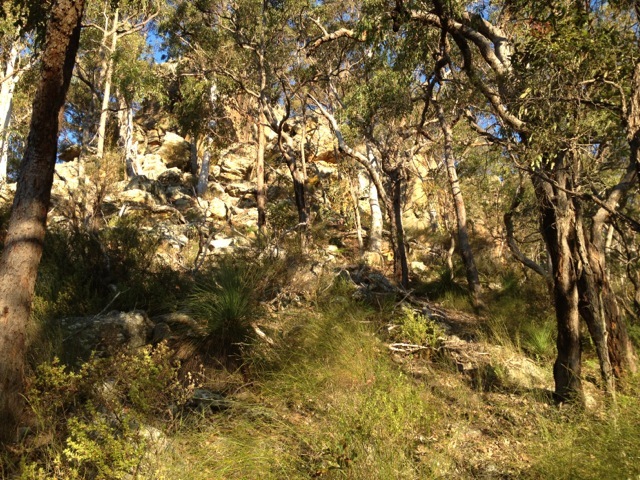 I walked for some time above the Lantana line with an awesome looking rocky ridge above me. I love rocky ridges. With the eastern face I was on already blanketed in shadows I hurried on. I rounded the side into the sunlight and pushed on further. Atop the ridge the rocky buttresses climbed into the sky with wind blasted small caves formed in their sides. There is one cave in particular which is an attraction of this hike and one of the reasons I was here. The cave did eventually come into view high on the ridge and I climbed up to have a look. It didn’t take me long to reach the aptly named Wind Cave with its sandy floor. I stopped briefly then pushed on to the top of the ridge where I took a rest. I turned to look back from where I’d come and for the first time saw the glittering blue of Lake Perseverance stretching away. This is the reason I love to hike, the unexpected views. Then behind me at the top of the ridge I found a dirt 4WD track. The track was wide and easily followed for the rest of walk. With still a kilometre or so to go, the sunset leaving me in deep shadows surrounded by forest. Thankfully I always carry my head torch and spare batteries. Soon after I arrived back at the junction I’d seen on my way in and shortly after arrived back at my van. Overall, an adventurous day of blood and sweat. I was looking forward to a hot shower, so headed off to the camping ground. I’m going to be sore tomorrow for my third hike of the weekend. 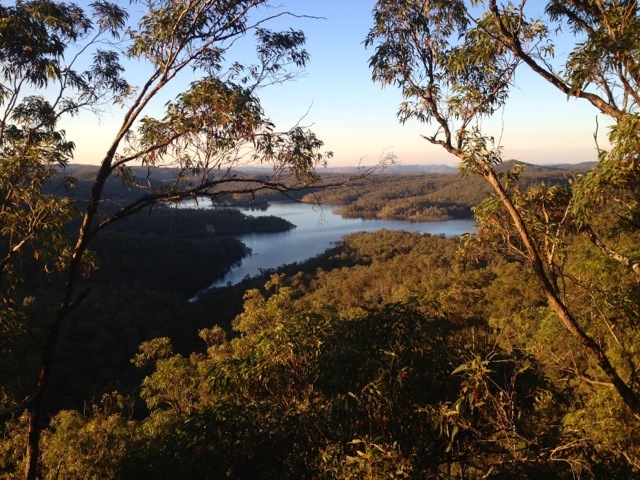 The Crows Nest National Park is just north of Toowoomba city, about two hours West of Brisbane. Lake Perseverance is part of the National Park and separates the two areas I will be walking this weekend. I drove up on Friday night to give myself plenty of time to walk the tracks I wished to. 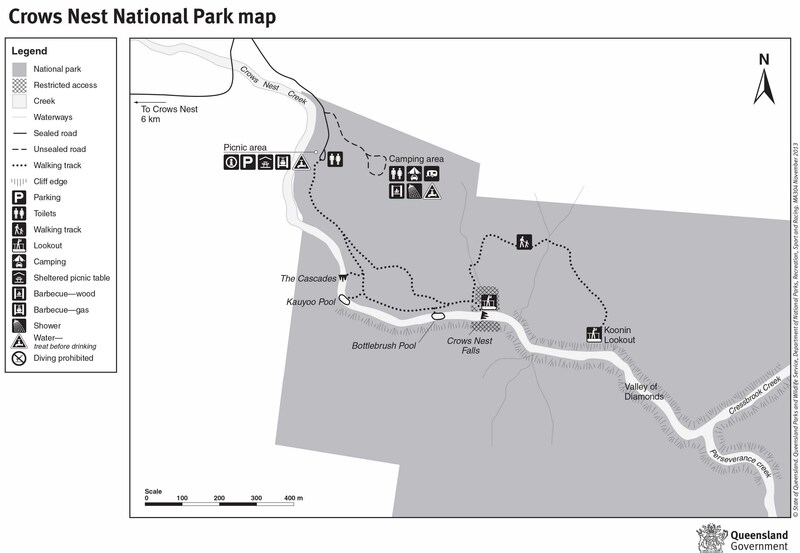 Today I will be walking in the southern end of the National Park. 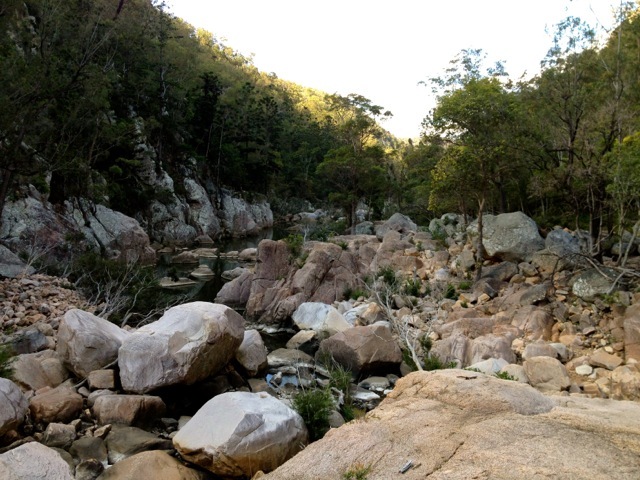 There are two hikes in this area and both are untracked and unmarked, however, guided by the book Take a Walk in South East Queensland – my SE Queensland hiking bible – I should be fine. I should be fine… famous last words. Following the instructions of the book I headed south along the fence line down a small gully and uphill to another road. This is where things hit a snag. 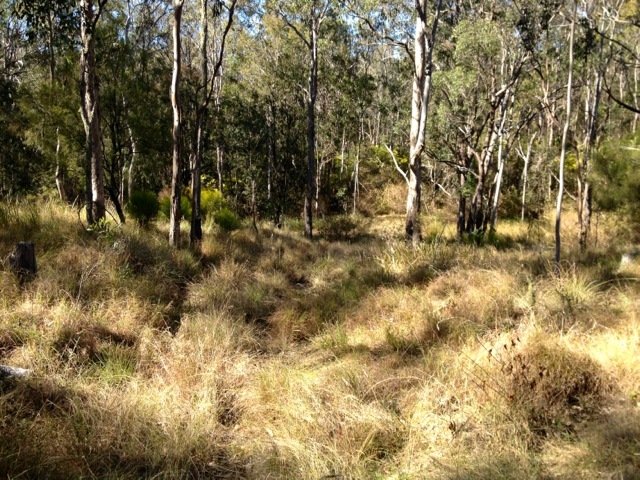 After the gully I came across a line of vegetation that I couldn’t get past. It was early in the hike so I decided to backtrack to beginning and instead followed a short road to the east. When the track finished abruptly I noted a pink ribbon on a tree – generally a sign of a marked trail – so I followed it. As expected the pink ribbon led to another pink ribbon and to a third. I kept following through a series of pine and ironbark trees. The area between the trees was light and grassy, with some sandy areas. The pink ribbons turned north at the top of the cliff over Perseverance Creek and I followed until they stopped abruptly. After there being one every ten metres or so along the trail it was odd that the ribbons would just stop. I skirted around in each direction looking for the signs of the next ribbon but found nothing. So taking a guess, I headed north. 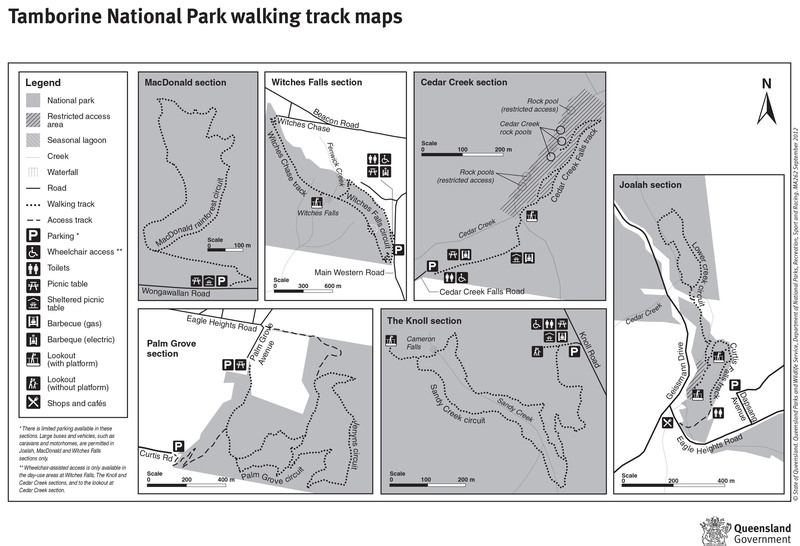 The book has a map of each hike showing the trail and giving a written description. Based on the curve of the creek I placed myself at a certain point, so I followed the description in the book. I followed the cliff line north, watching the curve of the creek below. At a not so steep gully, I made my way down. I could hear cars on the road to the south as I briefly checked out a gorge before I continued north along the side of the creek. After a short walk along the river’s edge, I came to a barbed wire fence that spanned the river and headed up the bank. I followed the fence inland for a while until it turned off and headed back into the river. I continued north, checking the map with my compass to ensure I was on the right path, or at least what I thought was the right path. I headed north and crossed through a large patch of Lantana. Lantana is a weed with little thorns along the length of its long thin branches that catch on to everything. Lucky there wasn’t much in the patch and I pushed through it easily and continued down the rocky bank to the creek. I walked along it for a little bit before crossing at a four-wheel drive track. I headed up a hill and came to another vehicle track, which I followed. I was supposed to go several hundred metres up the hill to a lookout, but found neither the top of the hill nor the lookout. Would I have found it if I had kept going? I don’t know. But I decided to head back and when almost back at the crossing, I went down the grassy hill to a set of cliffs and another rocky gorge. I crossed and headed north along a vehicle track with the creek heading north as well. The problem here was that the book and its map did not show any creeks running north, at all. 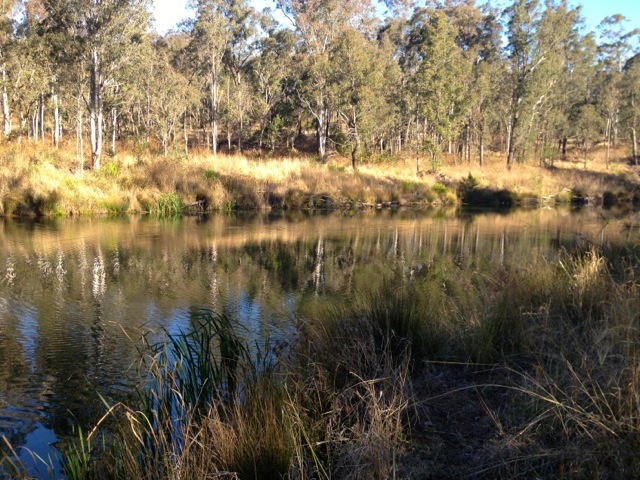 I continued walking north for several hundred metres along the creek before finally deciding to head back. At least it wasn’t difficult to retrace my steps back along the trail to my van. While I didn’t walk the exact trail the book had suggested, I still got a good hike in for several hours and perhaps covered ten kilometres. I arrived back at the van at 1pm, had a bite to eat before heading to the location of the afternoon’s hike, stopping for a quick coffee on the way. Today was my second day in the Bunya Mountains and after sleeping the night in my van, I was up early and preparing for two 4-hour hikes followed by a 3-hour drive home. Today’s hikes run into each other at the Cherry Plains Lookout and could be combined, but I chose to separate them and stop for lunch in between. 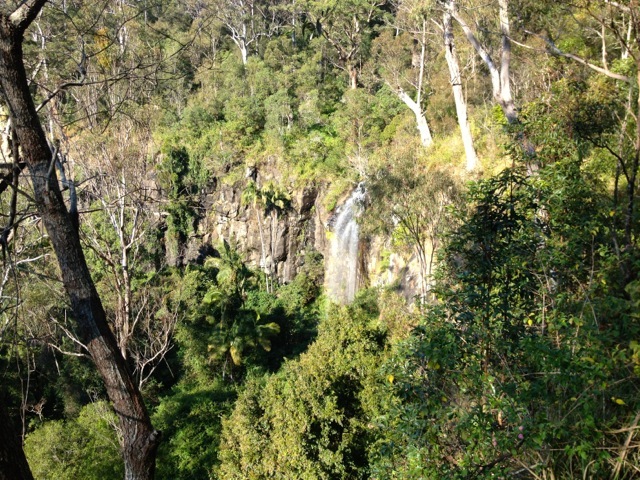 This hike begins at Paradise Carpark, an area I came close to on yesterday’s hike past Paradise Falls. 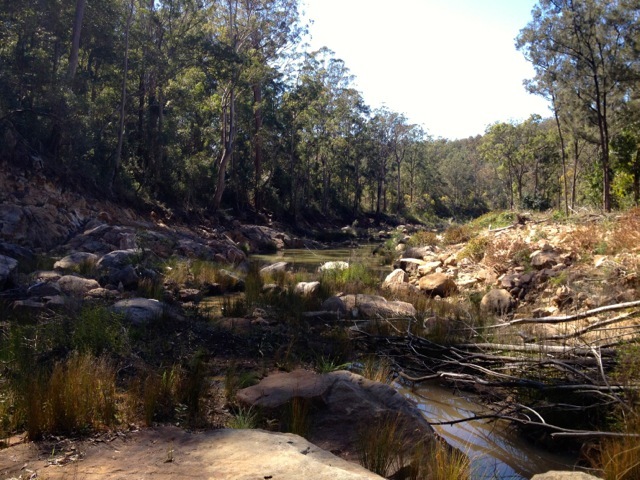 Yesterday’s hike was on the northern side of the Bunya Mountains, today’s hikes are both on the southern side. The walk began in a forest similar to yesterday’s. I quickly came to a place called Little Pocket, a small glade in the middle of the forest. It would make a great place to camp or for a picnic. The trail continued on the other side of the pocket with many ferns growing on either side. The trail meandered through the forest with the typical sound of the whip birds singing to each other. A slanted, tree laden cliff face dropped away on my left giving vegetation obscured views of the plains to the south heading to Toowoomba. I soon arrived at the Westcliff Lookout which gave me clearer views of the plains. 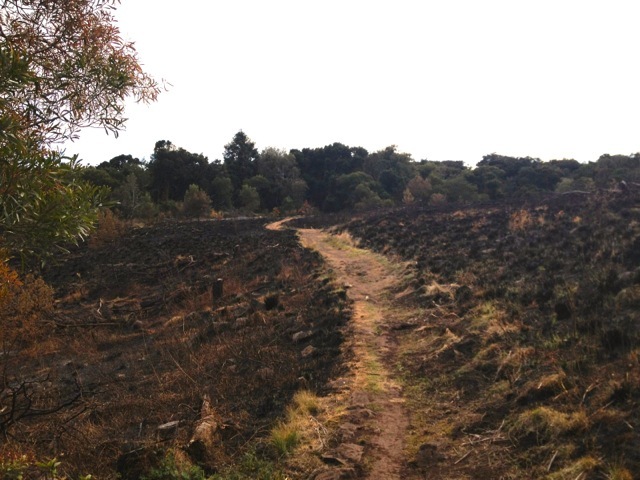 I walked back into the forest and eventually came to a burned area with new green shoots. The land is hardy and while I think this was burned as part of Queensland’s back burning campaigns for the dry summers, it’s always amazing to see the new green shoots pushing up through the blackened ground. At the far side of the of the area I emerged into the Westcott Camping area where I’d spent the night. I continued along the trail and headed downhill towards the Koondali Lookout and then on to the Valley View Lookout. Both gave the same sprawling views to the south. 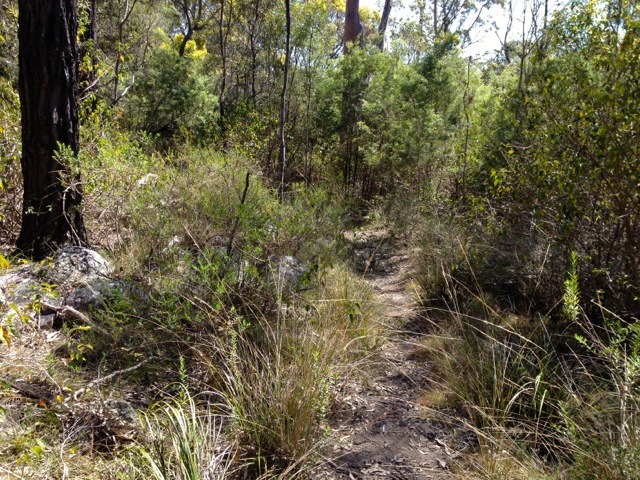 The trail led back into the forest, but this time the vegetation along the sides had changed. 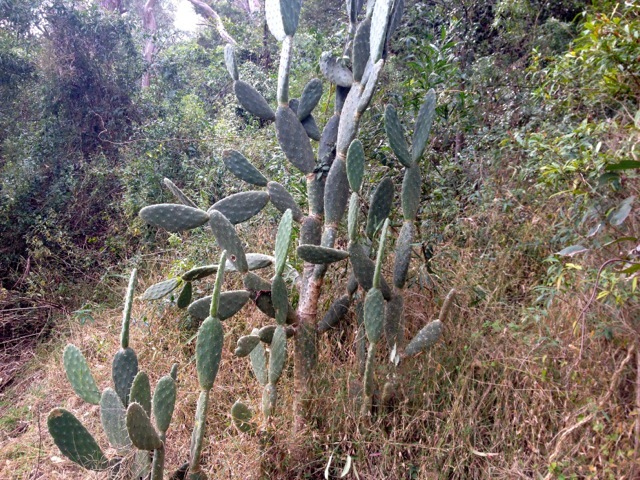 The ferns had been replaced with the sharp spiky leaves of stinging nettles and cacti. I’m glad I wore long pants today! The trail eventually winds its way back towards the road. So far much of the walk had been fairly flat or slowly heading down, not what I expected in the mountains. 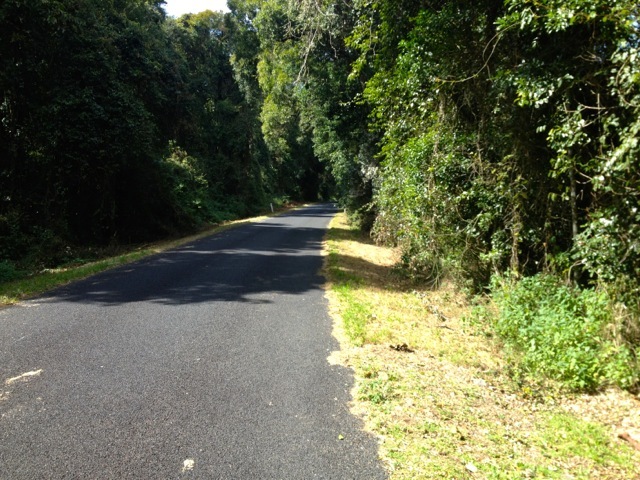 When I got back to the road, I followed it towards Paradise Carpark, some 3.5 km away. This turned out to be the hardest part of the hike as the road climbs steep hills directly to the carpark. The trail is suggested to take 4.5 hours, but it only took me 2.5. 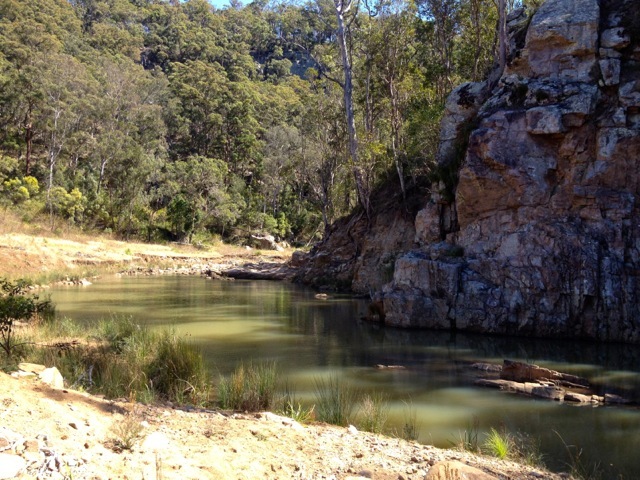 I drove from Paradise Carpark to Burton’s Well Carpark and stopped for lunch. I then set out along the trail which quickly came to a junction at the bottom of Mount Kiangarow, the tallest mountain in the National Park. While it didn’t take long to climb the 1.1km trail, it was actually nice to be climbing something, albeit rather gently. At the top the lookout is rather small with only a slim area to view from. A little disappointing, but you often get that. Back at the junction I headed south and then east along the cliff line. As per the end of the last hike, the vegetation at the side of the path was mainly nettles around the trees. The path again headed downwards, this time a little more apparent than earlier today. 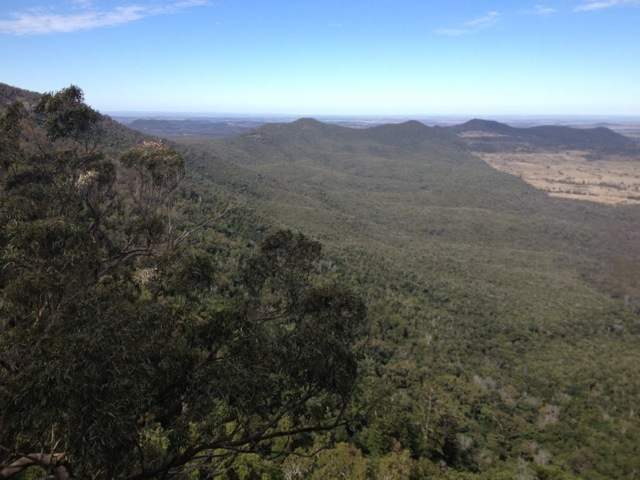 The Ghinghoin Lookout gave the same views south as much of the other lookouts. The trail then began to climb, not harshly, just long enough to keep the body working. While walking around the edge of the cliff, a bluff came into view and I could see a lookout platform on it. It was not a harsh climb, but after 16km of walking today my legs were starting a quiet burn. The lookout was surprising easy to get to and I sat for a moment to give my legs some time before heading back up along the path. My last stop before the road was the Cherry Plain Lookout which was overgrown and I wasn’t sure exactly what I was looking out over. The trail then joined the one I’d walked this morning and made its way for 1km to the road. This time I only had 2.4km of road to walk but again it was the steepest and hardest part of the hike. I arrived back at the van ready for my trip home. 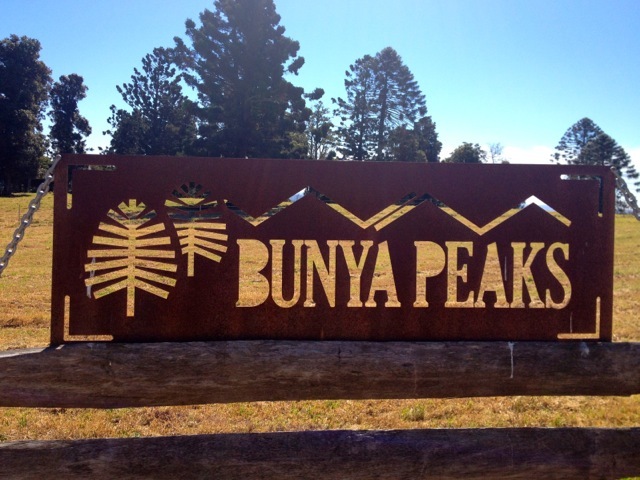 Overall, the Bunya Mountains are a beautiful place to walk with greatly varying vegetation depending on which side of the mountains you are on. Next weekend I’m heading off to Crows Nest National Park. 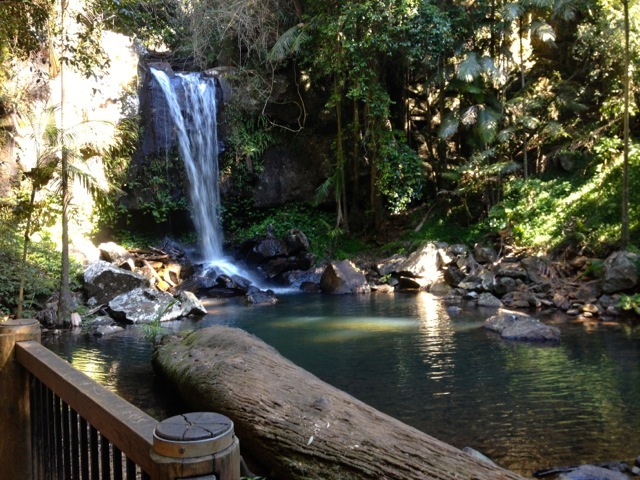 During the week I was in Tamborine Mountains National Park, Queensland’s oldest National Park. 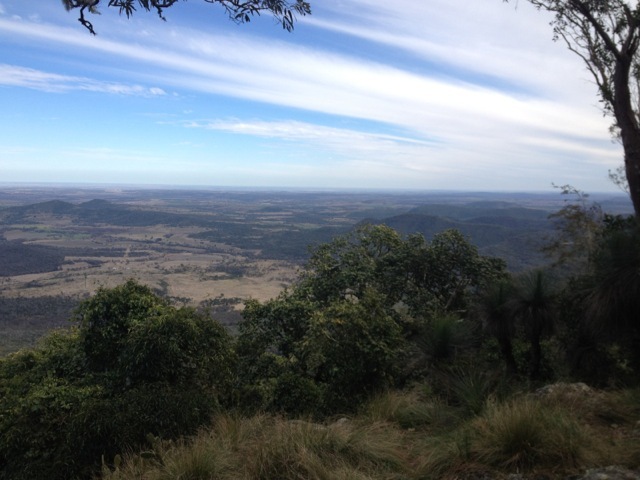 This weekend I decided to visit Queensland’s second oldest National Park: the Bunya Mountains. 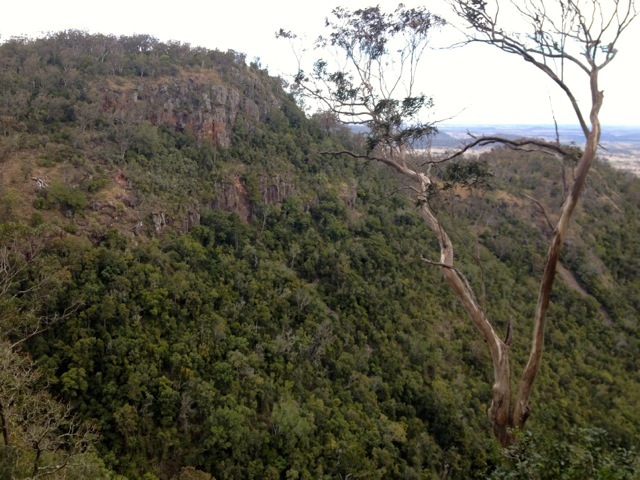 The Bunya Mountains is about 3 hours north-east of Brisbane. 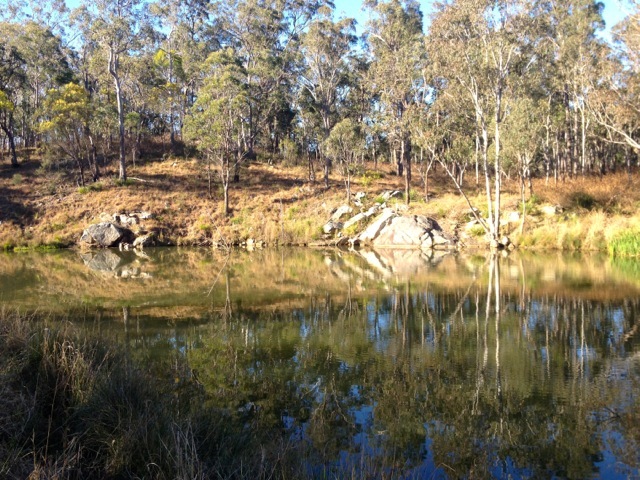 There are three main walks in the Bunyas, so I have come away for the weekend to walk all three. This is also an opportunity to try out my newly purchased ‘sleeper’ van – a van I have set up for a coming three-month trip around South East Australia. So, laden with food and my hiking gear, I set out for my overnight stay in an unpowered camping ground. 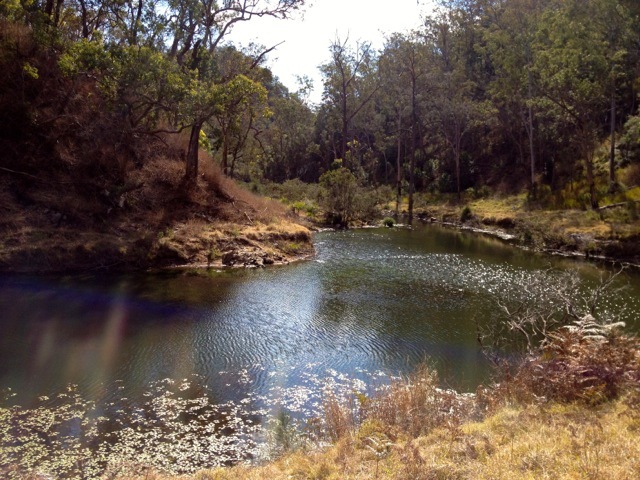 I arrived in the Bunya Mountains just after midday and quickly got myself sorted. My first stop is a camping area called Dandabah which is also the hikes trailhead. 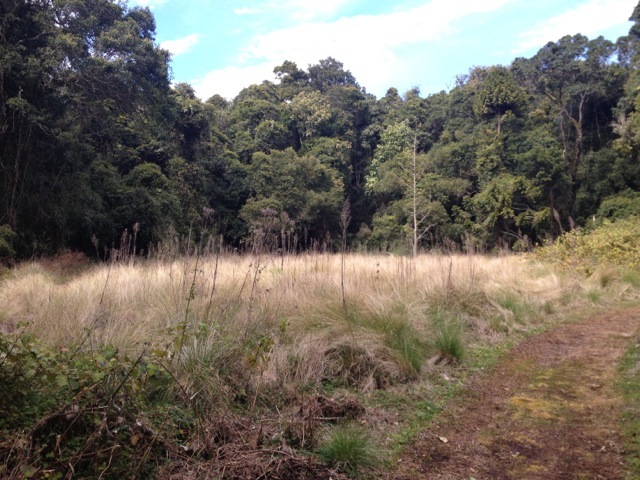 On arrival, my fantasy of being ‘lost in nature’ in the Bunya Mountains was broken straight away. The camping ground is surrounded by cafes, restaurants, groups of chalets and far too many people. Taking my daypack I headed out onto the trail. It’s nearing the end of winter in Queensland and the forest high in the Bunya Mountains is fairly cold. But I’m a quick walker, so it didn’t take me long to warm up. The dirt trail through the forest is wide and laden with tree roots. The Bunya Pines stand tall in the forest many with their companion strangler fig trees. One thing is also prominent as you follow the trail, the amount of ferns that cover the floor of the forest. After about 3 km of fairly flat trail a side track appeared with a sign that simply said ‘Paradise 80m’ and an arrow. So I followed! Of course, ‘Paradise’ is the quaint Paradise Falls. 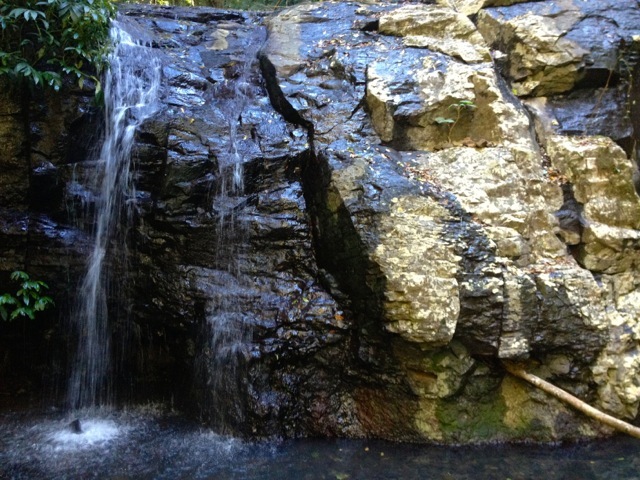 The trail then follows the rocky stream through the forest to Little Falls, a smaller but no less quaint set of falls. The trail continues on along the stream before meandering away from it to a lookout called Big Falls Lookout. This part of the trail is an open hill face and reminds me a lot of central Australia, rocky, dry, arid but with hardy grass growing everywhere. 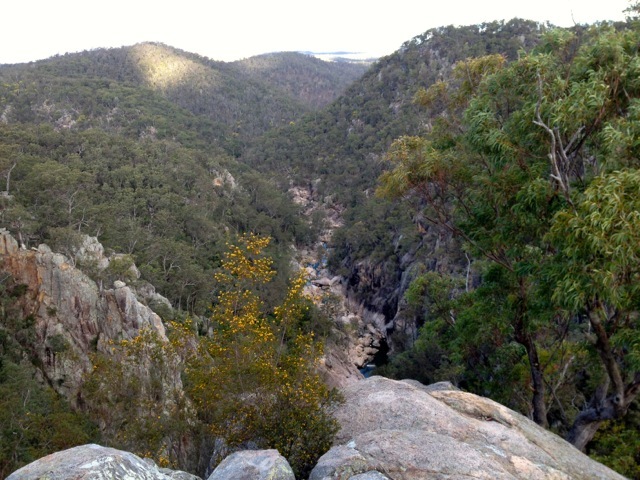 Perhaps with more rain there might be water in falls but the view from the lookout was only a dry and rocky cliff face. The trail continues to Barker Creek Lookout which looks out to the north across the valley. The most distinct feature of the view is the power station, although it is difficult to see in the photo. There is also a sign that says Noosa Heads 131km. The path meanders back into the forest and eventually arrives at the Tim Shea Falls, another quaint set of falls. This is where the Scenic Circuit begins at a large pair of Hoop Pines. 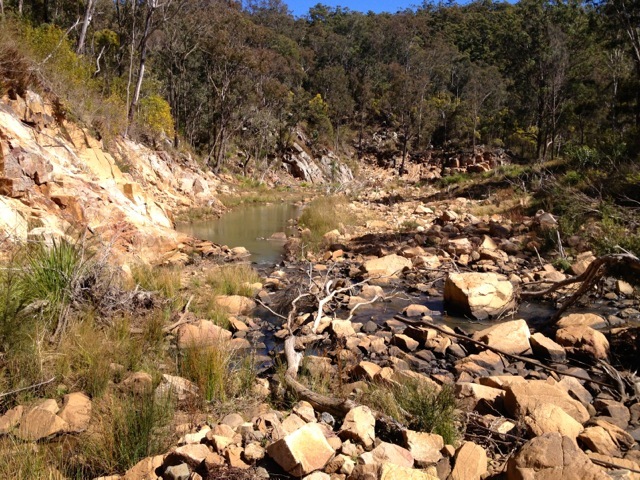 The trail then follows a stream with little rock pools scattered along its length until it reaches a lookout built to look at a single massive Bunya Pine. 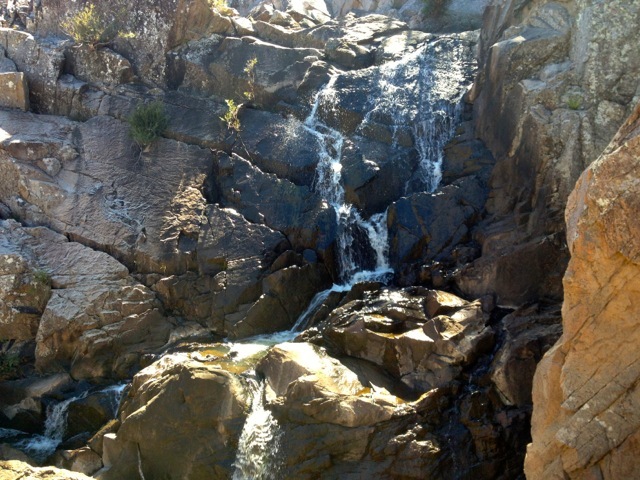 The trail continues to Festoon Falls, with its rocky surroundings it is the tallest and most magnificent falls in the mountains. The circuit then returns to the trailhead at Dandabah camping ground. 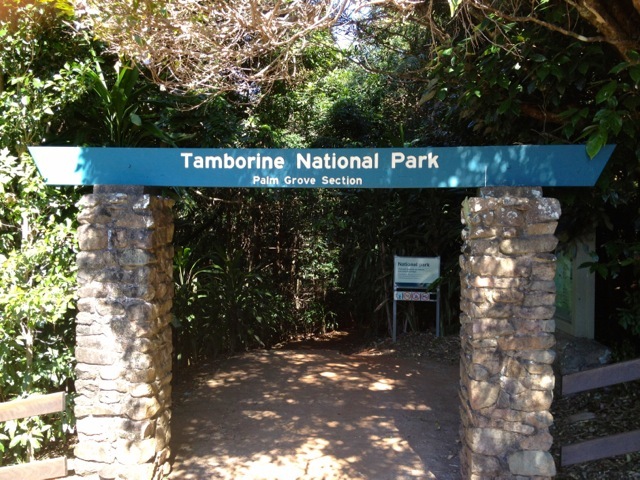 Mt Tamborine is about an hour south of Brisbane by car, 30 minutes north of the Gold Coast. It’s a popular tourist area in the mountains with many arty stores and great views of the coast. 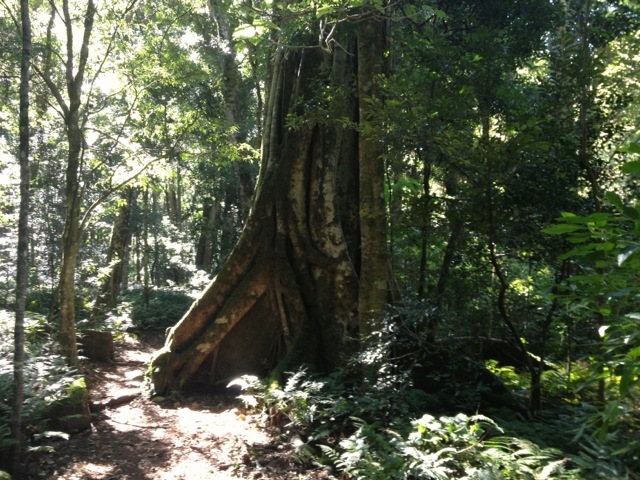 Mount Tamborine National Park is not a large single park but several smaller ones scattered throughout the region. It has 6 short walks with approximately 20km of trails between them. Today I’ve decided to walk all of them. Maps are owned by and used with courtesy of Queensland Government. Please visit that site for more detailed information on hiking in this region. 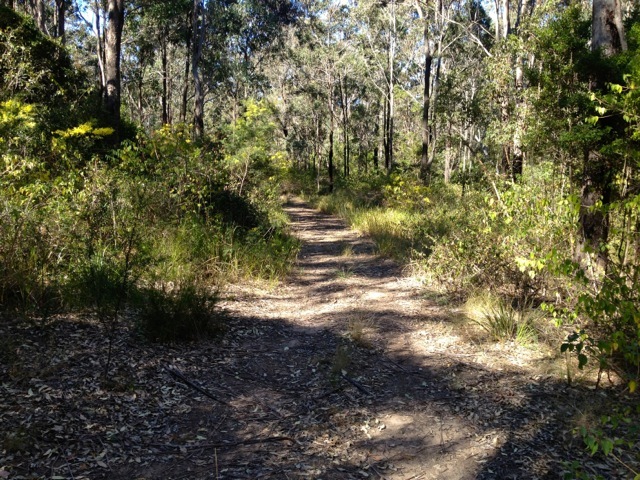 For my first walk of the day, I chose the hardest of the trails in Mt Tamborine. When I say hardest, I mean in a very easy kind of way. The rocky path meanders through the tall thin trees with plentiful small creek crossings. 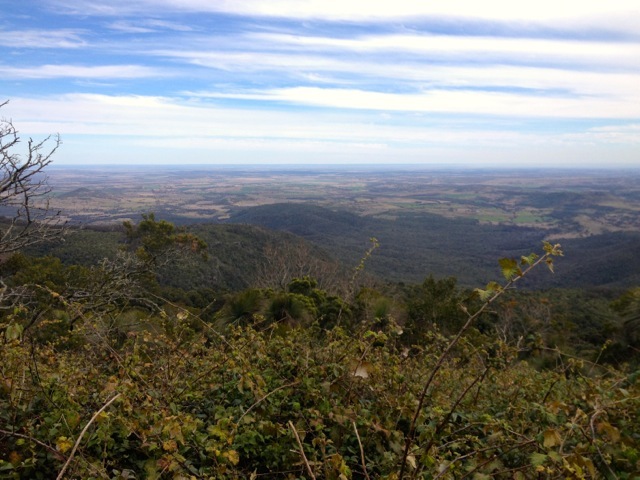 There are views to the south of Springbrook National Park and The Cougals. In this part of the National Park I saw the most wildlife, with several wallabies feeding near the entrance and an Iguana who started climbing a tree when he saw me before changing his mind and just sitting on the trail staring at me. Similar to Palm Grove, but without the animals. Much of the trail is sealed and was the most popular track of the day for visitors. The trail heads to a lookout at Curtis Falls, then along the stream where it crosses it at two places on concrete bridges. 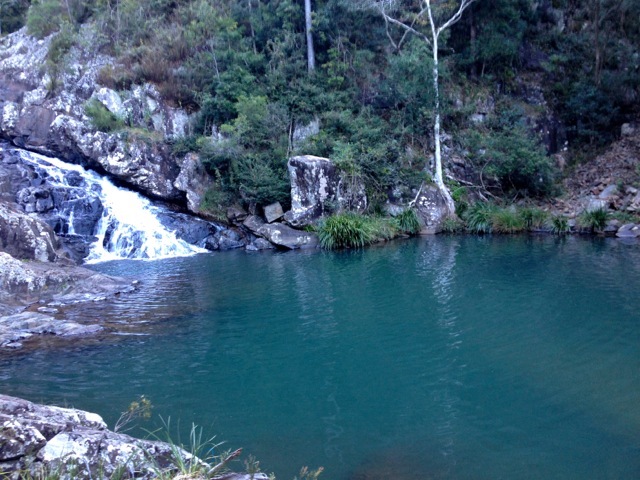 Witches falls was the first established National Park in Queensland. The rocky dirt trail leads along the road line at the top of the park, past a grave yard before plunging down a steep hill to the waterfall at the bottom. The lookout is set just to the side of the rocky waterfall and gives a partial view. The Knoll starts off at the top of a knoll (surprise! 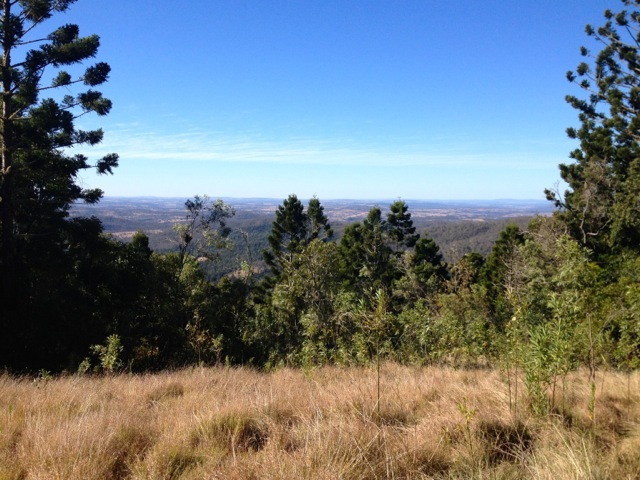 ), with a lookout to the west towards Brisbane city. The track begins fairly typically to the rest of the National Park, a rocky track heading through the rain forest. It meanders down the knoll to a lookout at the top of a cliff overlooking a waterfall. You can walk around to the top of the waterfall and stand on the rocky edge watching the water flow down to the pool below while looking out across green hills to the west. 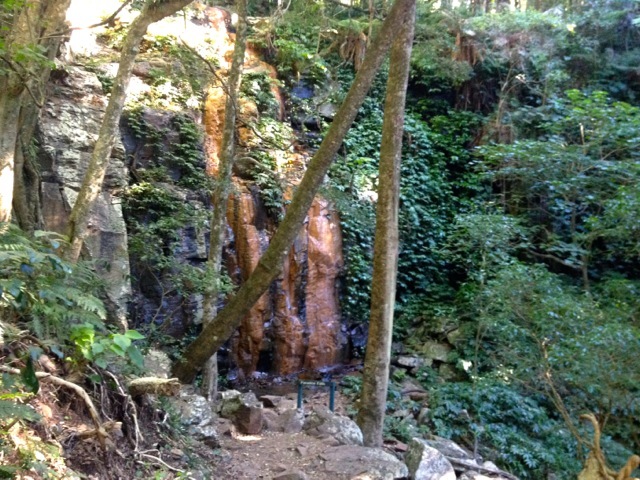 While only a very short and sealed track, the waterfall at Cedar creek is the best of the day. 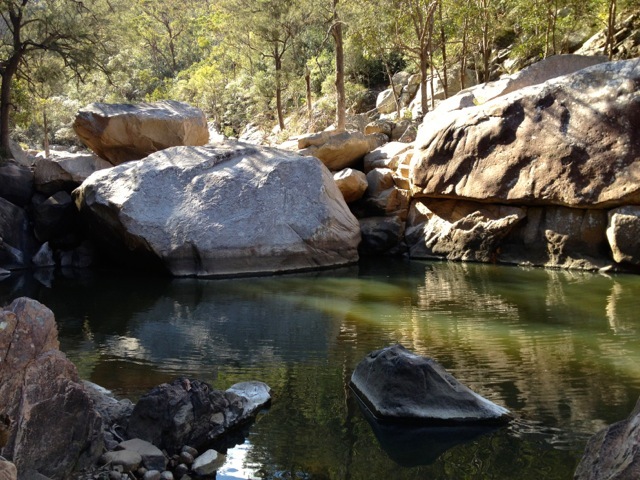 The water holes at the bottom are good locations for swimming in the warmer months (which is most of the year in Queensland). The path meanders down the mountain, stopping at lookouts before arriving at the bottom. A less sealed track continues along the river to another, larger water hole. 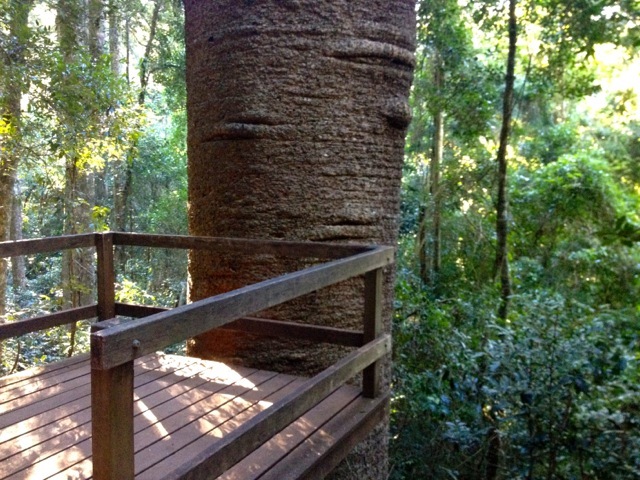 For my last walk of the day, the rainforest walk is just that, a walk around a rainforest. I suggest doing this walk first as beyond the rainforest, there’s not much else to see. 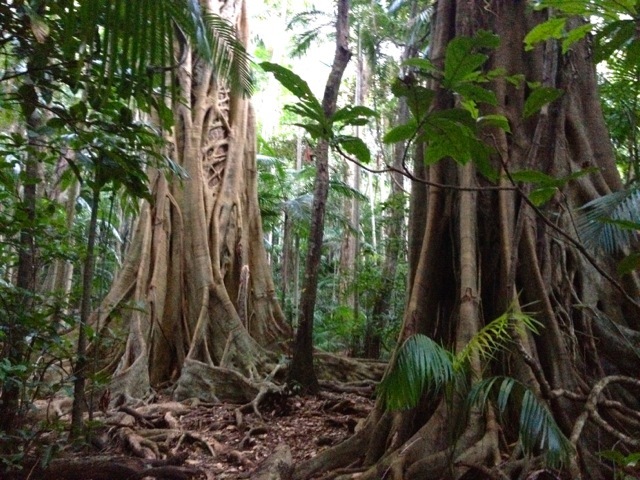 In saying that, the short rocky track is not a bad walk and there were a couple of large strangler figs along the way. The rocky dirt track was fairly easy. After climbing the Mount Mitchell Peaks a couple of months ago, I decided to take my hiking group to another of the hikes in the same area. I set this up a couple of weeks before I went to Tonga and on my return discovered more than 50 people had registered. I set the Aratula petrol station as our meeting place, about 10km from the beginning of the trail, making it easy for everyone to find. While 50 is a lot for a hike, I expected a third to pull out, but a total of 45 showed up. I discovered another group of 26 would also be on the trail also, so it was going to be busy. Because of the lack of parking at Cunningham’s Gap, I suggested car pooling, so leaving some cars behind, we set off for the trailhead. 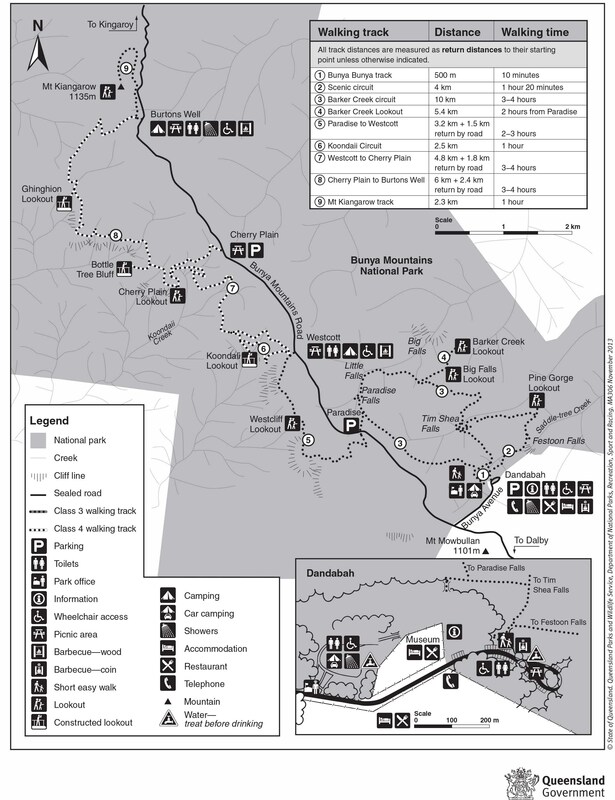 The Mount Cordeaux and Bare Rock trail is 12.6km return or about 4 hours. It’s a Class 3 (well defined wide dirt track) with points of Class 4 (rocky defined path). There are several trailheads leading off from the car park and I ensured we were heading along the right one before we headed off. The initial trail is a small circuit that connects all of the other trails together. 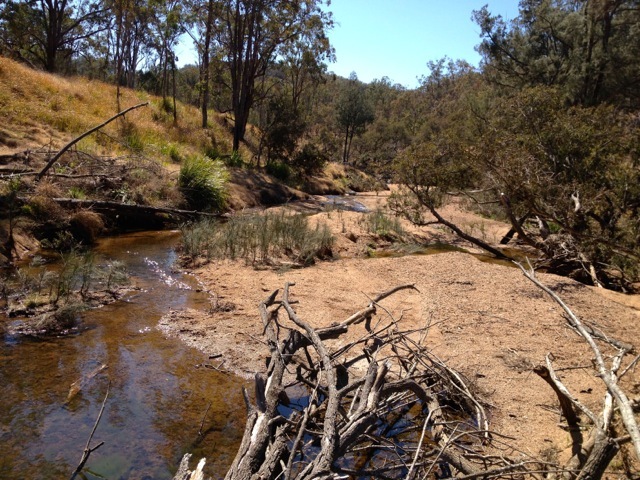 We walked along this on a wide dirt track to a lookout. We continued along the circuit trail until we found the turn off to Mount Cordeaux and headed along it. The track began climbing immediately. The track zig-zagged up the side of the mountain to a point where the vegetation cleared and the western peak of Mount Mitchell could be seen across the gap. About 4km into our climb and at the base of the great rocky face of Mount Cordeaux the trail forked. We took the path to the right on a rocky path around the side of the mountain to a lookout, climbing stone steps to get there. The lookout is a fairly large flat rocky area with plenty of room for our numbers. We stopped for a break, enjoyed the view across the valley to Lake Moogerah and Mount Greville – the next group hike I intend to arrange. After 15 minutes, I led the group back to the fork and we continued along the trail around the other side of Mount Cordeaux on rocky steps. We continued across a short saddle and into a throng of trees before the trail began to climb steeply. The climb was fairly brief and we soon emerged onto Bare Rock, a large area similar to the lookout with views north along the Main Range. Being late winter, I had expected it to be a little blustery, but we’d been lucky up to this point. Once at the top, however, the wind picked up and it cooled down. The group stayed for about half an hour, eating lunch and talking until the wind got too much and we set off down again. The climb to Bare Rock was not particularly hard and with so many people, was slow going. The trip down was quicker, with most being a gentle meander heading back towards the car park. The hike turned out to be a success with everyone enjoying themselves. To celebrate, 20 of us headed to the Aratula hotel for a beer – a must following a hike – before heading home. 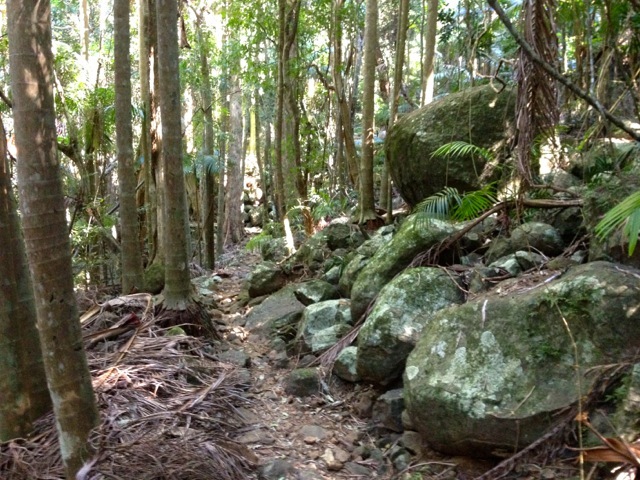 Next I’m back to my lone wanderings, the many short trails of Mount Tamborine.